The World’s Tallest Grandfather Clock showed up as a bicentennial gift for the City of Kewaunee. Towering 36 feet above the Ahnapee State Trailhead on the north side of downtown, this (working) Colonial-style redwood grandfather clock was built by Jake Schlies and his son Rodney on behalf of Svoboda Industries, a local business, which donated it to the city in 1976. It was moved in 1984 to the new “Top of Hill Shops” along Highway 42 north of downtown. It stood there for over three decades before the shop closed and the clock, while staying there, fell into disrepair. The building was sold in 2013; the clock was then dismantled and moved back downhill to a location on the north edge of downtown. Parts were reconditioned and the World’s Tallest Grandfather Clock went back up in its current location on August 27, 2014. 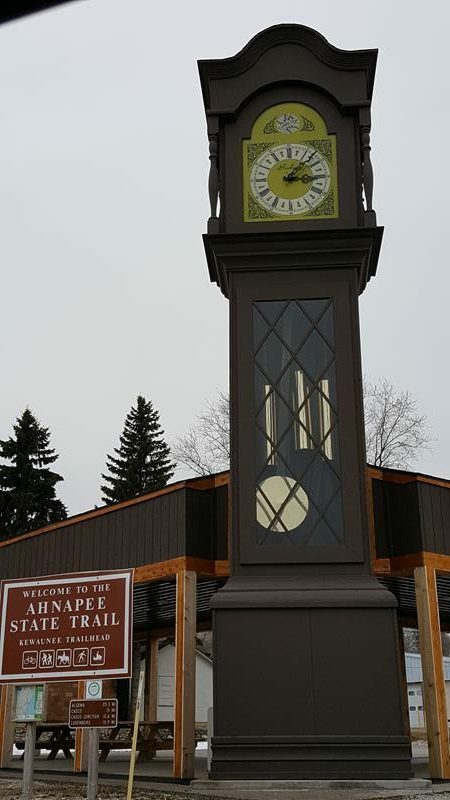 It now serves downtown with accurate time and towers above the trailhead for the Ahnapee State Trail, which runs west through the farmlands and woods of Kewaunee County on its way north towards Algoma. A pavilion and sound system were added in 2015, and now you can not only see the clock, you can hear it as it chimes every 15 minutes and has specialty music for various seasons and events. The World’s Tallest Grandfather Clock is just north of Highway 29, at the intersection of Highway 42 and Miller Street. The Tug Ludington, a historic jail, Kewaunee’s beautiful marina and harbor with its Pierhead Lighthouse, Parallel 44 Winery, and Bruemmer Park & Zoo are all nearby.